I didn’t time it this way, but today is my 11th wedding anniversary, as well as my 200th post. Happy Anniversary, Mr. Spinach Tiger. We will be celebrating coincidentally at a friend’s birthday party at Arrington Vineyards. We loved our coconut wedding cake and in honor of our anniversary, I am repeating a recipe. It’s the cupcakes I make for every special occasion. They show up every Christmas, Easter, Mother’s Day, and birthdays. They are worth repeating, and in the author’s own words as she commented on my post. “Thank you for loving these coconut cupcakes–a dreamy collaboration of sour cream batter and coconut frosting if there ever was one. No matter how many other coconut cupcakes I have baked and eating, these remain my favorite too.“ Lisa Yockelson, author of Baking by Flavor and Chocolate Chocolate. As I baked these cupcakes today, I started to remember that Friday at sunset in Long Beach California. A few weeks later, I was living in Nashville and onto a new adventure. When I said yes to the guy, I chose character over glamour, and I knew this decision would force me to a new standard of good. A great example of character came in our first year of marriage. We moved to an old historic neighborhood and lived in a big scary four square white house that I never grew to love. I put money on this house when my husband was out of town (inappropriate mistake), as I had to have this house. One Sunday evening a young man knocked on the door and told my husband he was hungry, and that God told him to come to this particular house because the people that lived here would come to his aid. He wanted to buy a chicken dinner at Mrs. Winners. Mrs. Winners chicken was a block away, the block that ventured into “bad neighborhood” territory. He was hungry and he had no money. Mr. Spinach Tiger never turns anyone away. He gave the money to the young man with a cheerful heart. My husband probably, for a moment, wondered who I was and where his wife went. And, it was a moment in our marriage I will never forget. My husband remained calm and picked up a bible and read to me from the book of Matthew, chapter 5, verse 42. My husband isn’t necessarily the guy with a bible in his hand, quoting scriptures. He is not a lecturing type. He is merely one who takes action and drives down the right road. Simple. Unglamorous. Good. He married someone not so simple, perhaps a little more glamorous and working on good (he sets a high standard). It’s not that I don’t have a heart for the hungry, but my fear took over and I felt threatened in my nest. But a marriage will push you out of your comfort zone and will grow you if you let it. And, in that first year of marriage, I grew. Ironically, we fed the man one meal, but he has fed our marriage for the last eleven years. Tell me, have you ever had a moment in your life where you were faced with an opportunity to respond to someone’s needs and you weren’t sure what to do? These cute cupcake holders are by Wilton. Coconut Cupcakes inspired by Lisa Yockelson's Cookbook Baking by flavor. A delicious dense, cupcake enhanced with the flavor of nutmeg. 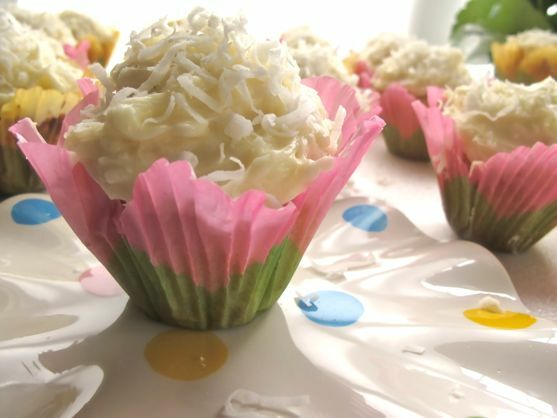 ¾ cup lightly packed sweetened flaked coconut plus extra for topping cupcakes. Measure out all dry ingredients. Sift together, including the nutmeg. It's easier to sift onto a sheet of waxed paper. Cream butter and sugar together for two minutes. Add eggs one at a time for 45 seconds. Add Vanilla. Beginning and ending with dry ingredients, alternate adding dry ingredients and sour cream and mixing. Add Coconut. Bring cream cheese and butter to near room temperature. Mix with mixer until thoroughly mixed through and smooth. Add in vanilla, cream and mix until incorporated. Frost cupcakes and top with more coconut. The link for your coconut cupcakes won’t work for me. Can you send out the link again? Thanks and love your site!